124cc single cylinder DOHC 4-valve liquid-cooled 11.2:1 comp ratio, multi-plate wet clutch, 6-speed gearbox, single Mikuni carb. Tubular steel frame, non-adjustable telescopic front forks, monoshock rear suspension (preload only adj. ), single 280mm front disc with 2-pot sliding caliper, single 220mm rear disc with 2-pot sliding caliper. If you've entered your teens with a need for two-wheels, lusting after Fireblades, R1s, GSXR1000s, ZX10s and the like, then the start your eighteenth year on this planet is the moment of liberation. From this point on, the "UK Powers That Be" have said that you, yes you, are responsible and mature enough to be 'trusted' with the operation of a real motorbike with gears and a clutch. Are they sane or what? But there's a catch - there always is! 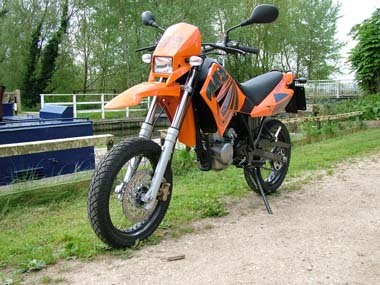 They say that it can't have an engine capacity greater than 125cc and may not develop more than 15bhp. Hmm? Okay, it can still have style, cool, and most important of all - credibility. Can't it? So what can you get? Well your buying criteria have ruled out all those "commuter-hacks" so loved by the training schools; there's a couple of 2-stroke race-reps, but you're never going to get Dad to cough up nearly four grand for one of them, and all the used ones have been de-restricted and thrashed senseless before you can say "second-hand". That leaves what? Well, you have to say that until recently the answer was "not a lot". Now while globally the sales of sub-125cc machines exceeds all other bikes added together, in the more affluent European market these bikes are seen as very small business. Let's face it, it's only because of our licensing laws that 125's really exist here at all, and most of us can't wait for our "two-year 125 probation" to be over before we can go out and buy a "proper bike" and scare ourselves witless with all that extra power and speed. 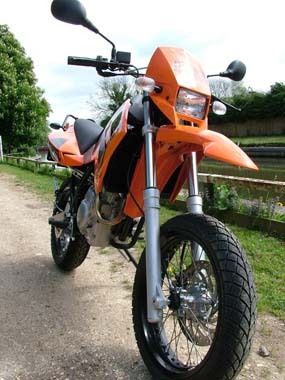 However, some manufacturers are now beginning to realise that owning and riding a 125 is not a sentence that has to be served before society will let you loose on a real set of wheels. When I collected the MZ 125SM from Jack Nice Motorcycles in Walthamstow, I have to admit that I was not really relishing the 60 miles ride back to the Thames Valley with only 125-power. But I was pleasantly surprised. MZ quote a power output at the maximum allowed of 15bhp, and I for one have no reason to doubt that number. While those few horses are never going to see you burning rubber at the traffic-light GP, they do give the bike a quite surprising burst of acceleration and a comfortable cruising speed of 60mph without resorting to slipstreaming white vans and the backs of trucks. In fact, indicated speeds in excess of 70mph can be attained without lying flat on the tank or searching out 1 in 3 hills, but you do need a lot of road with the throttle pinned to the stop. The engine is MZ designed and built, and it seems to be a good one. While no 4-stroke is ever going to rev like a 2-stroke, the 4-valve DOHC head allows the little engine to breathe well, and it revs happily with no flat spots all the way up to 10,200 when the limiter cuts in and brings everything to a halt for the sake of mechanical preservation. The other thing that was immediately noticeable was that this is a full-sized proper bike. 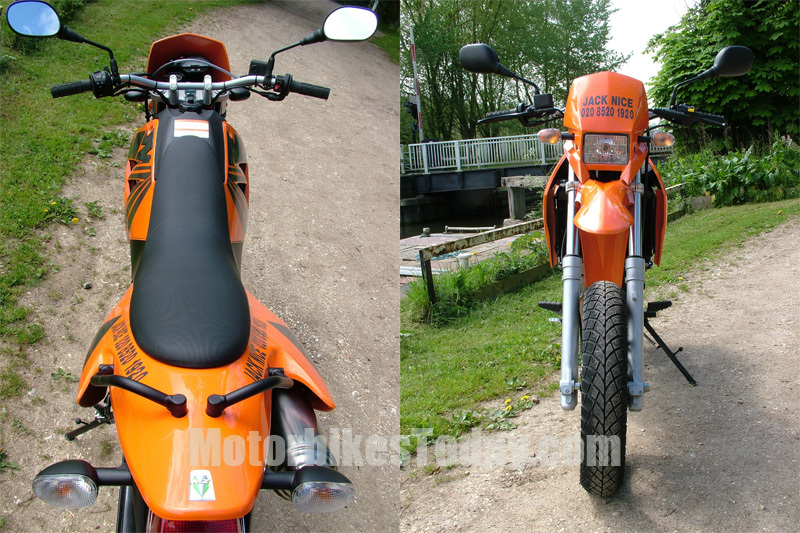 There are some 125's out there that are more like scaled-down versions of the real thing, a bit like mini-moto's on steroids! You know, spindly forks, paper-thin plastics, frames that appear to be made of welded water pipes and castings that would be more appropriate on toys than on bikes. Not the MZ 125SM. The plastic body panels are thick and substantial, with a good deep paint finish, decals are properly applied and lacquered over - unlike some oriental offerings I won't mention! 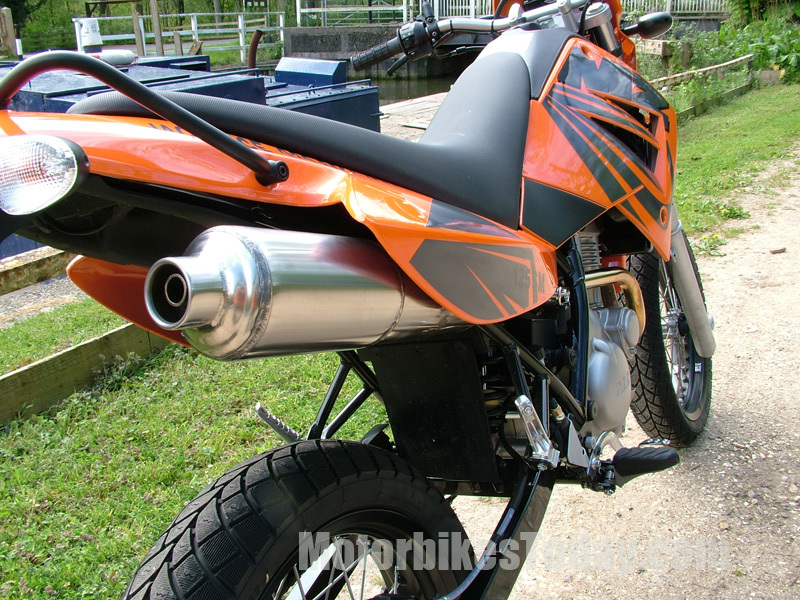 - the 40mm fork tubes wouldn't be out of place on a sports 400, the exhaust system is stainless throughout, the brakes lines are braided stainless, and those black-anodised wheel rims are well tasty. In fact this is one very well put together machine, even the frame has been black epoxy coated for protection. But the proof of the pudding is in the riding. Throwing a leg over that 820mm saddle height seems a little daunting at first, but the soft long travel suspension compresses a long way, and most riders will have no problems with getting both feet firmly on the ground. Up front, the wide bars have all the usual controls in all the usual places and the switches have a solid quality feel to them. The small headlamp shroud hides a fairly basic instrument cluster with a central analogue speedo and "idiot lights" for main beam, low oil pressure, coolant over temperature, indicators and neutral. There's even a trip. A turn of the ignition key powers everything up, set the manual choke if the engine's cold, and then a quick press of the starter button fires up the engine on a steady tickover that seems like it could go on until Hell freezes over. Given that MZ quote an average fuel consumption of 88mpg and the tank holds 12.5 litres, this is probably not too much of an exaggeration. I make that 242 miles on a full tank before you have to get off and push! The 6-speed box has a light if slightly clunky action and the lever is set well into the frame like some Ducatis. This caused one or two lever/boot interaction failures in the first couple of miles of riding, but this was soon overcome. More interestingly there were some false neutrals, mostly between fourth and fifth and once or twice the box failed to move through neutral when trying to change from second to first and first to second, requiring a second stab at the lever to get it into gear. In its defence, the bike was almost brand-new when I picked it up, and this may have been just a matter of getting everything bedded in properly. Certainly the problem diminished the more I used the box. On the plus side, the ratios are well-spaced and clutchless upchanges are a doddle, which is just as well as with only 15 bhp on tap you're constantly going up and down the box if you want to maintain a decent rate of progress. And lets face it, this is a bike for some serious, if low-powered, looning about. The suspension is well-damped and just soaks up the bumps and potholes, so much so that you may wonder why there's been all that fuss over speed bumps. The down side is some serious dive on braking, but much of this can be dialled out by balancing things up with the rear brake. The brakes, which are Grimeca items, certainly do a good job and are well-matched to the performance of the rest of the bike, with a solid feel and a smooth progessive action. The wide bars and the 17-inch wheels make the bike a quick steerer, so much so that it quickly becomes impossible to resist the temptation to throw the bike around corners with gay abandon. And you should, because it's so good at it! The handling of the MZ 125SM is really excellent, but it can get a bit upset on mid-corner bumps if you're getting a move on. However, it never gets too unruly and all you get is a bit of a shaking as the long-travel suspension compresses and rebounds. More importantly it stays on the line. The test bike was shod with tyres from a German company called Heidenau, that I hadn't heard of before. They were a soft-compound tyre with a narrow block-pattern tread reminiscent of race intermediates, and they certainly did the biz. Wet or dry roads seemed to make little difference to the grip available, and inspired the confidence to throw the bike around the twisty bits the way it was designed for. 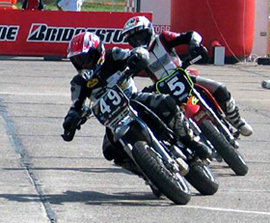 Lean angles can get so crazy that if you're not careful, pretty soon you'll be tempted to stick the inside boot on the ground around corners in true supermoto fashion. In fact it's fair to say that this is a learner-legal 125 that has performance. 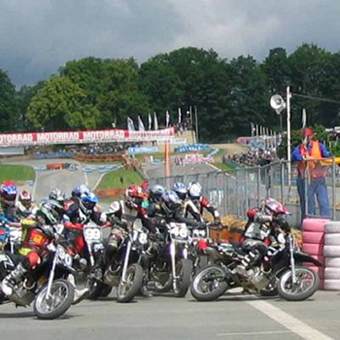 MZ obviously think so too, as in Germany they're promoting the Youngster Cup for kids to race these things. The engine is stock and all the lights and indicators are removed, and they're allowed to change the front springs and the rear monoshock, alter the chain sprockets and fit handguards. And that's about it to go racing. The action is close, fast and furious, but at the moment I haven't heard of any plans to bring the series to the UK. It would be great to see this kind of racing on some of our home circuits and it could provide many of our younger riders with a good, low cost entrance into bike racing, as well as developing some useful riding skills. Now back to the road version. This is an excellent 125, and just because it's learner-legal, Fireblade and R1 owners shouldn't be put off. There's more to having fun on two-wheels than just outright speed and racebike handling, and the MZ 125SM will soon have you grinning from ear to ear without having to worry too much about racking up more penalty points on your licence. And if you're 17, then your Dad will love you for riding a bike that's been properly built from real components, and doesn't look like it's been assembled from spares in some far-eastern shed. There are a few small niggles though. While the bar-mounted mirrors give an excellent rearward view - you can almost read the label on the back of your jacket - they do stick out an awfully long way. This can make squeezing, what is after all quite a narrow bike, through gaps in the traffic, a bit of a nightmare. A couple of shorter-stemmed mirrors on those wide bars would make slipping through the traffic a breeze and still give you a good view of what's going on behind. Another concern, for me at least, is that supermoto seat. This is not a bike for travelling long distances, so don't even think of going touring unless you take your proctologist with you! And he wouldn't dream of travelling pillion. About 30 miles is as far as you'd want to go without taking a substantial break, and 50 miles will have you thinking of seeking medical assistance. Finally, in true supermoto fashion, the plastic fuel tank has a screw-on filler cap. There's obviously an issue with security in today's urban environment, but more interestingly the tank vents through the centre of this cap which means that every time you pull up your nostrils tend to get assaulted with unleaded fumes. A simple fix would be to replace the standard cap with one from Ascerbis with a central vent pipe that can be led down and secured to a lower part of the frame. But these small problems aside, this is one very good bike. The build quality is first class, the fun-factor is immense, and I only wish there bikes like this around when I took my test all those years ago.